The Danville City Council has approved its new 2019-2020 Fiscal Year Budget. Included in the document is money to hire a police chief and a fire chief, according to Mayor Rickey Williams, Jr….. Currently Danville operates with a Public Safety Director who oversees both the police and fire departments. But Vice Mayor Brenda Brown supported the increase in the hotel-motel tax…. The new budget also reduces the number of Code Enforcement positions from four to three, and eliminates a position in Public Affairs. It is the job held by the person who has been coordinating the First Friday Celebrations and other events in Downtown Danville. 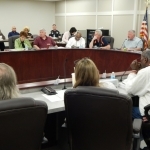 Mayor Williams succeeded, though, in getting the city council to agree to a $1,000 per month allotment to try to find someone who will continue those efforts.